Discover the new generation contemporary-styled backpacker properties with Urban Pack, one of the newest design hostel in Hong Kong. A cozy pad tailored for the modern day global traveler. Owned and operated by two friendly Canadian pals, located at the very heart of the city, among the bustling streets of Hong Kong, seconds away from the Tsim Sha Tsui station and Kowloon Park. We are also within walking distance to many major attractions such as Avenues of Stars & the museums, and of course there are hundreds of fabulous local eateries to be found at every turn to cater to the unique tastes of our our backpackers. We are also minutes away from the China Ferry Terminal if you choose to travel onwards and the Star Ferry to venture out across the island. Everything was top quality. Friendly staff, great location, nice bathroom and showers. Large and nicely decorated lounge area. A small tip to the owners: can try to make the bedroom doors open/close more quietly, as some guests were not careful and let the doors slam shut loudly. Also could open the lounge area a bit earlier if possible. Great Stay. Awesome location and lovely staff. The room was a bit small but I think that's just Hong Kong. Easy to get there from the airport on the bus and right next to a metro for travelling around. Good... Hygiene, convenience in terms of location, security, Wifi Not so good... The way the hostel is spread out, makes it very inconvenient to get from 1 floor to another with the long wait for elevators. No social/recreation facility for after 12 am ( for late sleepers like me) I had no emotional experience to comment further. Thank you for having me as a guest. 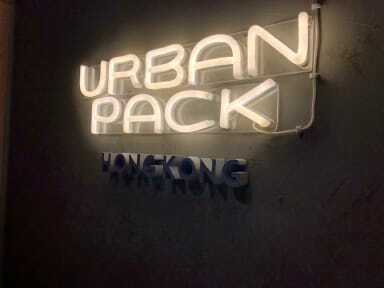 Very much enjoyed my stay at Urban Pack. Super clean, friendly accommodating staff, and great location super close to bus stops and metro. Rooms and beds are a bit small but this is the norm in Hong Kong. Dorms are also spread across the building, and the common area is on its own floor. But again, I think this is common for the city, and having a common area at all was great for meeting people. Would definitely stay here again if back in Hong Kong! Cannot beat the location - right in the centre! However, very poor ventilation at least in our private room (not sure abou dorms). Weird smell out of the aircon! Did not use any of the facilities so cannot comment on that. If you like staying in small places this is the hostel for you. Honestly I have seen bathrooms bigger than the dorm room. I know it’s Hong Kong but seriously. One night was enough here. Good area of town and close to MTR. Hostel is disjointed with rooms and common areas on different floors. Location for this hostel by far it’s best feature, in a great neighbourhood and close to major sights. However, it feels like a missed opportunity. Social areas are good but dislocated and poorly utilised, 4 bed dorm was tiny, beds the smallest we’ve stayed in in fact I’ve stayed on bigger sofas. Toilet and shower were broken when we stayed, although staff offered a drink as compensation. Ok for a couple of nights but won’t stay again.